The Cousteau family returns to the big screen for a three-dimensional dive that goes deep to reveal the ocean’s mind-bending beauty in minute detail, yet comes up a little shallow when it comes to addressing the human flaws that now define the landscape. Like so many young people who grew up in the 1960s and ‘70s, I found an early hero in the red-capped Cousteau. The stunning images of a secret world beneath the waves, populated by mysterious creatures that floated through blue space, deepened my love of the water. I watched every TV special. I made models of his ship, the Calypso, as well as the PBY Catalina aircraft emblazoned with the sea nymph who enchanted Odysseus. It was a true blue crush. His calm tone and purring French accent brought The Silent World to life, and in many ways, became the very voice of the ocean and its myriad inhabitants. When he died in 1997, shortly after his 87th birthday, the throbbing absence of that voice only grew more painful as the devastating effects of climate change became more apparent. He spent the last part of his life trying to warn us. In 1970, he called for the Southern Strait of Georgia to be designated a marine protected area, predicting the entire ecosystem would be dead in 20 years if pollution from pulp and paper mills continued at the then-going rate. Economics reduced craft effluent as the industry transitioned, but other pollutants are increasing, along with water temperatures and shipping traffic, keeping the Strait’s 3000 indigenous species — and those of countless other habitats — on the brink of extinction. A big dose of Cousteau could help about now, and thanks to none other than Arnold Schwarzenegger, that’s exactly what we get in Wonders of the Sea 3D, a new documentary opening in select markets February 1. Featuring Cousteau’s son, Jean-Michel, and his adult children Fabien and Celine, Wonders of the Sea feels like a continuation of the former California Governator’s mission to address Climate Change. Listed as co-producer and narrator, Schwarzenegger appears to be as nostalgic as the rest of us, perhaps hoping that a film with the Cousteau brand and accent might be enough to get us woke in its wake. Listed as co-producer and narrator, Schwarzenegger appears to be as nostalgic as the rest of us, perhaps hoping that a film with the Cousteau brand and accent might be enough to get us woke in its wake. Sadly, that’s kind of what Wonders of the Sea 3D feels like: A wake. Or, perhaps more accurately, a celebration of life, because there’s a palpable effort here to stay positive by skirting the big picture, and focusing in startling detail on the very small. 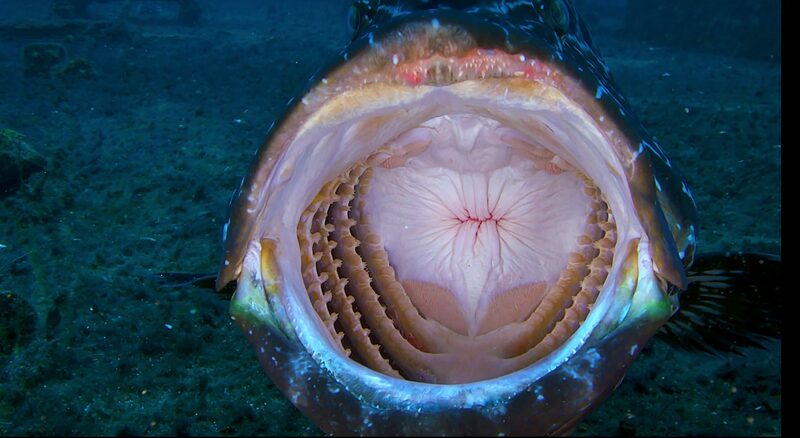 What Freudian Nightmares are Made Of: The mouth of a giant grouper, now a species at risk, photographed in close-up high-def in Wonders of the Sea 3D. Taking us from Fiji to the Bahamas, Cousteau returns to reefs and habitats originally explored by his father with cutting-edge high-def and 3D digital equipment. We see the beauty first. We learn about each particular species and their interdependence on the creatures around them. We’re given the opportunity to marvel at the large and the small, ponder the civics lesson in diversity and survival, and most importantly, reminded of the ocean’s ability to recover and heal. If we give piscis a chance. We’re given the opportunity to marvel at the large and the small, ponder the civics lesson in diversity and survival, and most importantly, reminded of the ocean’s ability to recover and heal. If we give piscis a chance. It’s the big “if” that silently defines Wonders of the Sea, even though filmmakers Jean-Michel Cousteau and François Mantello go out of their way to focus on the divine splendours of the deep that remain. Between bubbles of airy chatter for children, and awkwardly contrived family verité, we’re made fully aware of how fragile this miraculous ecosystem really is. But we knew that already. Even if we didn’t know half the Earth’s breathable air is produced by phytoplankton, or that oceans acidify with excess carbon dioxide, or that pharmaceuticals are now having a measurable effect on marine environments around the world, we know reefs are dying and ice shelves are melting. The filmmakers don’t show us the graveyard until the final act, showing us what a dead reef looks like covered in sand, littered by lifeless nacre relics. A thriving metropolis of colourful hustle and bustle reduced to a murky ghost town. Dead. It’s desperately sad, but it was important to get it in there. The whole thing would have felt delusional without a solid acknowledgement of the urgency. Yet, the younger Cousteau’s voice is never alarmist. Always seeking to bring a hopeful tone, as well as his father’s largely apolitical approach, Jean-Michel and his two children do their best to relaunch the Cousteau name for another generation. They play to curiosity, and a childlike interest in nature. What’s missing is a sense of grown-up responsibility, both in tone and content. Jacques Cousteau’s documentaries appealed to children, but they weren’t written for children. They never spoke down to the viewer the way Wonders of the Sea often does, glossing over uglier details to focus on something goofy. Even the family dynamics are dumbed down. The Cousteaus are a fascinating, storied and tragic crew. Jean-Michel’s brother Philippe died in 1979, and a little over a decade later, Cousteau revealed he had a second family with an Air France flight attendant named Francine Triplet. The whole family legacy is at risk, reflecting the very meta-theme so gorgeously displayed in three dimensions. The film could have found even more depth had it been brave enough to address the human flaws that define us, and now, the very environment that surrounds us. All the same, there’s something unfathomably comforting about listening to a Cousteau’s Gallic gurgle, and re-immersing oneself in the wild blue yonder below. Editors Note: The word “piscis” is Latin for fish. No Replies to "Wonders of the Sea 3D chants Give Piscis a Chance"